Service Costs > How Much Does it Cost to Unlock a Car Door? How Much Does it Cost to Unlock a Car Door? Unlocking a car door may be necessary if you lock your keys in your car and are unable to find a way in. Walking out to a locked car, unfortunately, will more than likely mean you are going to have to call a locksmith to get your door opened again if you do not have a spare key nearby or at all. How much does a locksmith cost to unlock a car door? The cost of unlocking a car door is going to depend on the locksmith, the time of the day, the type of lock, where you live and the complexity of the issue. Most of the time, a locksmith is going charge $55 to $75 to show up on the scene; however, to open the door, it should only cost an additional $10 to $20, bringing the total a pinch less than $100. If the call is made after midnight, the costs could double. The same could be said if your key was broken and a new one needed to be made as this could increase the costs as well. Lastly, if you lost the key and your car uses keyless technology, then the costs could reach as high as $250. In most cases, if you do have roadside assistance as part of your insurance policy or a premium credit card, it may be free or heavily discounted. For example, AAA, according to their policy, a locksmith for Classic members will cover up to $50, while Premium members are covered up to $150. Most companies will only travel within a certain radius; if they have to go outside of it, additional fees may apply. A premium may be charged if the call is made after certain hours. For example, one company would charge double if the call was made after midnight. In the case of a car lockout where the key breaks off, the broken car key may need to be extracted from inside the car. This could add another $50 to $100 to the total. If there is any damage done to the car, such as scratches from the lockpick, the locksmith will not cover this. They may make you sign something stating this in advance. While most mobile locksmiths are going to have a minimum fee, some may be able to work with you if they only have to travel a few miles. The closer the car is, the less you should have to pay. If you are near a gas station, see if you can borrow a slim jim. This device will allow you to get into the car by placing the slim metal piece through the window and frame to hit the unlock button. When choosing a locksmith, always make sure that he or she is licensed. Locksmiths, when they arrive on the scene, should be able to prove their license with a wallet-sized card. 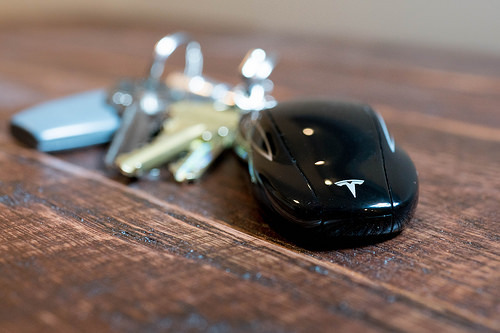 A local dealer may be able to offer a temporary key that may unlock the car. If you are stuck and have a smartphone handy, look up some videos and tips online. There are many different tricks you can try before resorting to calling a locksmith. WonderHowTo.com shows you how you can unlock your car with some simple tools. Insurance companies, such as AAA, offer roadside assistance as part of its insurance package. If you pay a monthly fee for OnStar, this also may apply. Check with them to see what they may charge if you were to lock your keys in the car before even calling a locksmith. According to their policy, they can unlock a car up to three times a year. If you are stuck out of your car, try to call at least three locksmiths or tow truck companies before choosing one. If you don’t know where to start, either call 411 or check out Google Reviews or Yelp. Depending on which city you are stuck in, some police stations may be able to unlock the car for you. If you have a spare set at home and someone is able to access them, ask a friend or family member to pick you up. If you do this, you could always pay them half the cost of what you would pay the locksmith or tow company. Most car companies give you a spare key when you purchase a new car. This key is usually only capable of unlocking the door and not starting the ignition. Make sure that you keep this key in a safe place so that you are not stuck in this position in the first place. To prevent this from happening again, consider buying a magnetic box that attaches to the underside of your car. Inside, you can leave a spare key in the case the situation arises again.